John Tramell is the son of Ben William "Scoot" Tramell and Patricia Mae Bagwell. Jimmy Myron Bagwell was born on 23 November 1936 in Gainesville, Hall County, Georgia. He was the son of Nathan Garland Bagwell and Mamie Florance England. Jimmy Myron Bagwell married Susan Hardy before 1958. Jimmy Myron Bagwell died on 23 October 1984 in DeKalb County, Georgia, at age 47. Karen Bagwell is the daughter of Jimmy Myron Bagwell and Susan Hardy. Karen Bagwell married (?) Kitchens. (?) Kitchens married Karen Bagwell, daughter of Jimmy Myron Bagwell and Susan Hardy. Sarah Elizabeth Shaw married James Anderson Savage, son of John S. Savage and Ann H. Gillespie. John S. Savage was born in 1800 in Edgefield District, South Carolina. He married Ann H. Gillespie. Ann H. Gillespie was also known as Gillaspey. Her married name was Savage. She married John S. Savage. 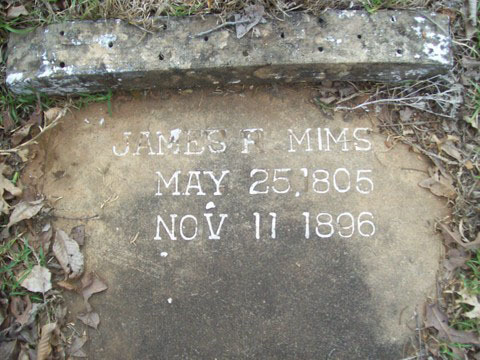 [S1717] James R. Mims Grave Stone, Find a Grave, www.findagrave.com. [S1665] Email from Jim Hipp dated February 2011 to Hunter Wayne Bagwell; Subject Line: RE: James R. Mims Family History. Margaret DeBose was born on 17 January 1806. She married James R. Mims circa 1825. As of circa 1827,her married name was Mims. Margaret DeBose died on 14 October 1844 in Autauga County, Alabama, at age 38. She was buried at Walnut Creek Methodist Church Cemetery, Chilton County, Alabama. Elijah Mims was born on 14 May 1826 in Chilton County, Alabama.1 He was the son of James R. Mims and Margaret DeBose. Elijah Mims married Millite Lethia "Millie" Goodgame on 7 December 1848 at Chilton County, Alabama. Sargent, Co G, 31st Inf AL CSA. [S1719] Elijah Mims Grave Stone, Find a Grave, www.findagrave.com. 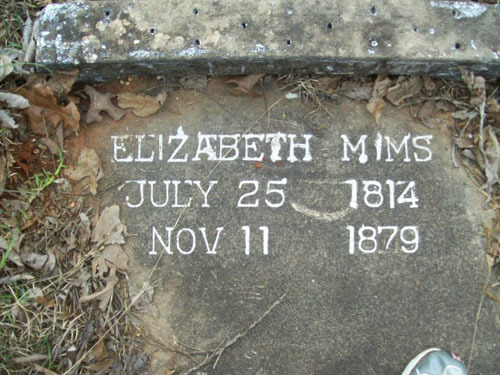 [S1718] Elizabeth Barber Mims Grave Stone, Find a Grave, www.findagrave.com. Green Mims was born circa 1856 in Alabama. Green Mims was the child of James R. Mims and Elizabeth Barber. Margaret DuBose Mims was born circa 1851 in Alabama. She was the daughter of James R. Mims and Elizabeth Barber. Martha Ann Virginia Mims was born circa 1845 in Alabama. She was the daughter of James R. Mims and Elizabeth Barber. Rebecca Mims was born circa 1828. She was the daughter of James R. Mims and Margaret DeBose. Feraba Mims was born circa 1833. Feraba Mims was the child of James R. Mims and Margaret DeBose. Samuel Peyton Mims was also known as James Samuel Peyton Mims. He was born on 28 December 1835 in Alabama. He was the son of James R. Mims and Margaret DeBose. [S1720] Millie Lethia Goodgame Mims Grave Stone, Find a Grave, www.findagrave.com. Martha Emily Mims was born in 1850 in Chilton County, Alabama. She was the daughter of Elijah Mims and Millite Lethia "Millie" Goodgame. Payton Franklin Mims was born on 16 August 1852. He was the son of Elijah Mims and Millite Lethia "Millie" Goodgame. Sarah Ann Mims was born on 11 May 1857. She was the daughter of Elijah Mims and Millite Lethia "Millie" Goodgame. Callie Knight died before 1920. Surety/Perf. Name: W. W. Morris. Clara V. Marlin died on 3 February 1965 at age 86. She was buried at Cottonwood City Cemetery, Cottonwood, Houston County, Alabama. Surety/Perf. Name: W. P. Windham. [S83] USGenWeb Archives - Westview Cemetery, Ozark, AL. [S82] Email from Virginia Goff dated 6/29/2007 to Hunter Bagwell - Subject Line: Jewett Texas Goff Family Information. Children of Virginia Grace Goff and Robert Richard Vaughan Jr.